Tea Party Express is promoting a petition effort insisting that Scott Brown be immediately seated in the U.S. Senate. Their petition has accumulated 27,000 signatures, it needs more. Please add your signature to mine, copy this blog post and email it to everyone you can influence. The Democrats are desperate for a way to delay and nullify Brown’s vote in the Senate. We must be more insistent on the immediate certification of the vote and swearing in ceremony so that Brown can begin executing the voter’s will. Two exit polls were conducted, the results from one of them have been published. This is how Fabrizio, McLaughlin and Associates summarized their analysis of the results. poll results reveal the fact that one single message was being sent above all others. Opposition to Obama Don’t Care was at the top of the list, overshadows the other issues. The electorate of Massachusetts sent a clear political message. The Democrats are seeking a way to ignore that message. It is up to us to backup those voters and reinforce their clear message. We can do that by signing and promoting the Tea Party Express petition demanding the immediate certification and swearing in of Senator elect Scott Brown. That senate seat has been monopolized by the Democrats for nearly fifty years. Democrats outnumber Republicans among registered voters in Mass. That fact adds great emphasis to the electoral message. We have one way to make that message more emphatic, lets do it now! Jihad Watch also has a five minute video in addition to the transcript. Update 12/15/11: While Wilders was acquitted in the second trial, Muslims are dragging the case into the U.N. Since Fitna continues to be an exemplar of the subject matter the OIC seeks to outlaw, this subject retains its vitality. The trial of Geert Wilders began January 20 ’10 and will resume February 3 unless the judge acts affirmatively on Wilders’ motion for dismissal. As I interpret it, Geert Wilders is referring to the great risk that freedom of expression will be lost, never to be recovered, in which case future generations may take a very dim view of our generation. He also raises the issue of special privilege, the exalted status asserted by Islam. He characterized Islam as an ideology that threatens freedom, and postulated a right and duty to speak out against it. This raises necessity as a defense. In his concluding remarks, he expressed hope that the court will allow him to call witnesses who will testify about Islam’s threat to liberty and to the truthfulness of his documentary and speeches. Thus he also raised the truth defense. If what he said is objectively true, it can not be slander or defamation. The importance of this trial can not be exaggerated. Freedom of expression is at risk. While it may be lost to Holland in this trial, this trial may set a precedent for similar trials elsewhere in Europe and perhaps even in the United States. The ayat quoted by Wilders in Fitna and his speech to the Dutch Parliament were documented in a previous post, part of which is reproduced below, slightly edited. The cited ayat are listed and quoted with links to Ibn Kathir’s Tafsir. Reasonable people, reading this evidence, can only conclude that Wilders told the truth; that his speech and documentary are factual, neither slanderous nor defaming to Islam. Sponsored by an Australian political party, Climate Sceptics [their spelling], this presentation contains absolutely vital information which you need to see. It displays graphs which explicitly and clearly contradict the false assertions of the plunderers and how much they are plotting to steal from Australians. The same logic applies to the Cap & Tax scheme proposed by Obamination. I received a Powerpoint presentation by email. The Sceptics’ web site offers the same information in a 4mb pdf file. We must strike while the iron is hot, while the Democrat Party machine is reeling from the effects of the special election in Massachusetts. Now is the time to tell your friends about the availability of free scientific information about the global warming issue. We need to apply pressure to the politicians. http://www.congress.org/ makes it easy to send an email to your Representative & Senators. All you need to know is your Zip Code. Just copy and paste this url into your email: http://www.climatesceptics.com.au/wp-content/uploads/2009/10/PPP-printing-version.pdf . This is a prime example of the information contained in the report. Notice the large area of divergence between CO2 producing fuel consumption and temperature. The graph makes one fact obvious: global temperature is not a direct function of fossil fuel consumption. The graph below makes it clear that global temperature is not a direct function of CO2 concentration in the atmosphere. I want you to click this link to view the full report, then use the url included in the previous paragraph to share it with your legislators and friends. This may be our last best chance to stop the plundering of our economy, don’t let it slip through your fingers. Obama Don’t Care: Last chance to Stop It! Grass Fire Nation is ramping up its final emergency petition campaign to stop Obama Don’t Care. They are seeking 50,000 more signatures on their petition to be delivered within the next two weeks. This may be your last chance to sign on to their petition demanding NO! votes on legislation that will lead to loss of liberty, the destruction of our medical care system and both personal and national bankruptcy. Please click this link http://www.grassfire.net/r.asp?u=24135&PID=21414098 and add your name to the petition. If the machine fails to steal enough votes from Scott Brown in the Massachusetts Senate race, there will be increased pressure on Congress to heed our objections to that potentially fatal legislation. Let us strike now, while the iron is hot and may begin to soften. Hope will live right up to the final cloture vote in the Senate. Lets do everything we can to keep that hope alive! Your petitions will be hand delivered to your Representative and Senators. Congress.org makes it easy to send an email to your Representative & Senators. You don’t need to know their names or district numbers, you only need to know your Zip Code. Enter it and click the Federal Officials link, then fill in the simple form. Don’t just say NO! when you can say HELL NO!!! You don’t need to write it yourself, just paste in this link to the biggest, brightest, boldest execration possible within the format of the blog where the message is posted. If you want a bureaucrat between you and your doctor, if you want restrictions on your drug and procedural options, if you want to be told to go home and die quietly, then sit there and do nothing. If you want long waiting periods, shortages and denial of care, go back to sleep. Otherwise, sign that petition and send those emails. Our health, prosperity and freedom depend on it! I was invited to USC to speak about this problem and specifically about an incitement to kill Jews posted on an official USC website and attributed to the prophet Mohammed. The incitement was originally posted by the USC Muslim Student Union. It was removed last spring by Provost Nicias, who called it “disgusting,” over protests from the Muslim Student Union. It was recently restored to a USC website by another campus group. When this re-posting came to my attention, I contacted USC students and said I would like to come to campus to address this and related issues. This led to my invitation from College Republicans. That saying is part of Islam’s canon of codified oral tradition, a prophecy which sets the final genocide of the Jews as a precondition for the Muslims reaping their rewards in Paradise. It is not the cry of “Itbach-al-Yahud” often heard in Islamic sermons, it is part of the basis for those sermons. Variant forms of that saying are common in Islamic literature, including the Charter of Hamas. A variant remained in the database: Sahih Bukhari 4.52.177. Whether they are published on a university web site or not, those sayings inform us of the genocidal character of Islam. They serve to warn us of Islam’s intentions. Removing them is like amputating a snake’s rattles or painting a skunk’s stripes, depriving us of a warning. My principle objection to censoring the hadith is that it deprives us of a means of authenticating the evidence of Islam’s genocidal character. I frequently cite that hadith, including a link to it so that readers can verify its authenticity and explore related hadith. While such sayings re removed from the web, they remain in thousands of books and articles and in the minds of millions of Muslims. Nothing is accomplished by removing one saying from one web site. The revival of this issue can serve a purpose by affording another opportunity to reveal the evil at the core of Islam. The Qur’an includes a demonic injunction to make war upon Jews, Christians & Zoroastrians. Now you know that Muslims are commanded to make war on Jews and that the Muslims can’t enter Paradise until they finish the job. While there is plenty of antisemitism in the Qur’an, one ayeh stands out above the rest. Ibn Kathir’s tafsir of that ayeh brings a new dimension to it. …In the future, the Jews will support the Dajjal (False Messiah); and the Muslims, along with `Isa, son of Mary, will kill the Jews. This will occur just before the end of this world…. Another prophesy contains a less explicit confirmation. Read between the lines. When President Obama and others assert that Islam is a “great religion of peace”, those of us who have explored its canon of scripture, exegeses, tradition & jurisprudence can use quotes from those sources to refute the lie. Instead of demanding censorship, we should be exposing the core of Islamic doctrine in the harsh light of truth. Expose Islam’s violent antisemitism, don’t obscure it. Having read several articles asserting that Pakistan’s delegate had, on behalf of the OIC, submitted to the Ad Hoc Committee on Elaboration of Complementary Standards,[See also: Ad Hoc Cmte Draft Document] a proposal containing the text of Ireland’s new blasphemy legislation, my curiosity was aroused. I posted a blog comment expressing doubt, and disappointment that the post did not provide a link to the source of the claim. I prepared to compose a blog post about the issue, but after diligent search, I was unable to find specific information. Serendipitous discovery of a document hosted by Article 19 has brought the truth to light, proving my assumption to be in error. I had assumed that the referenced proposal had been made previous to the recent meeting of the committee. In fact, it was submitted on October 23 and it does, in its first section, include significant text from the Irish blasphemy statute. If Irish Catholics enacted it into law, it must surely be acceptable, right? Not by my standards! The quote below comes from page 11 of the following document: A/HRC/13/55, the report of the Ad Hoc Committee on the Elaboration of Complementary Standards. [The link in the UN document system is broken.] Since the pdf is a scanned image, I used Softifree OCR to convert it to text. I have attempted to edit errors introduced by the conversion process but have left original spelling and syntax intact.I have added bold font emphasis to identify the purloined prose. c) Discrimination based on religion or belief. States Parties shall prohibit by law the uttering of matters that are grossly abusive or insulting in relation to matters held sacred by any religion, thereby causing outrage among a substantial number of the adherents to that religion. States Parties must enact legal prohibitions on publication of material that negatively stereotypes, insults, or uses offensive language on matters regarded by followers of any religion or belief as sacred or inherent to their dignity as human beings, with the aim of protecting their fundamental human rights. States Parties shall prohibit public insults and defamation of religions, public incitement to violence, threats against a person or a grouping of persons on the grounds of their race, colour, language, religion, nationality, or national or ethnic origin. States Parties shall provide, within their respective legal and constitutional systems, adequate protection against acts of hatred, discrimination, intimidation, and coercion resulting from defamation of religions, and incitement to religious hatred in general, and take all possible measures to promote tolerance and respect for all religions and beliefs. States Parties shall penalize public expressions with racist aims, or of an ideology which claims the superiority of or, or which deprecates or denigrates, a grouping of persons on the grounds of their race, colour, language, religion, nationality, or national or ethnic origin, and enact legal prohibitions on offences in which religious motives are aggravating factors. States Parties shall apply and reinforce existing laws in order to combat and deny impunity for all manifestations and acts of racism, racial discrimination, xenophobia and related intolerance against national or ethnic, religious and linguistic minorities and migrants and the stereotypes applied to them, including on the basis of religion of or belief . The following quote is from page 26 of the Irish statute. Of course, there is a little detail which the authors do not tell us about, and which the OIC did not plagiarize: defenses to the charge. find genuine literary, artistic, political, scientific, or academic value in the matter to which the offence relates. The egregious element of subjectivity stands out in both documents. How do you define and measure “grossly abusive or insulting”? How do you define, measure and establish the existence of “genuine literary, artistic, political, scientific, or academic value”? How do you establish intent? Is any nation likely to include, in similar legislation, clearly defined and provable offenses & defenses? Boilerplate in previous resolutions expressed concern about “defamation”. President Obama prefers “negative stereotyping” to “defamation”. The OIC can reluctantly drop its demand for the “defamation” clause, Obama can claim victory, and we loose our freedom of expression. Lets make a close examination of the proposal to censor critics of Islam. Is highly refined abuse or insult permissible under the proposed legislation? How does one determine the difference between gross and refined insult? By what standard is outrage to be established? What constitutes a substantial number? Sanctity is in the mind of the believers? Why is it not defined by the contents of sacred texts? How are we to know what everyone considers sacred to their dignity? In what charter is the right to be shielded from all potential offense established and enshrined as a fundamental human right? What constitutes incitement to violence? According to Ban Ki-moon, Fitna is incitement to violence.. The only incitement in the video comes from the Qur’an and Imams. By the UN standard, exposing incitement constitutes incitement. They are demanding that governments promote tolerance and respect for Islam, which informed and reasonable people consider intolerable because of its intolerance and violence. How are “racist aims” to be defined and measured? Islam is not a race, it afflicts members of several races. Islam began as a manifestation of Arab supremacism. One glaring defect stands out in the proposal: subjectivity. Muslims are set up as judge & jury; states as executioners. The offense exists because they invented it. We are guilty of it because they say we are. This is a status offense: not being Muslim. The thirty third ayeh of Surah Al-Ma’idah lists hudud for waging war against Allah. Ibn Kathir’s Tafsir defines that term thusly. If you recite a Christian creed, you are guilty of disbelief, opposing and contradicting Islam and may be sentenced to death. The OIC is demanding that the UN and its member states enforce that Islamic law against us. According to Shari’ah, as codified in Reliance of the Traveller, a dhimmi may be killed for several listed offenses including reviling Islam. What is impermissible? The list of acts entailing apostasy includes these items. Among other things, dhimmis are forbidden to recite scripture aloud and display crosses. The Ad Hoc Committee is expected to meet in March. We need to send a clear message of rejection to the United States Department of State. This is not an issue amenable to compromise. Our right of free expression must not be abridged! When the protocol is published, we must rise up as one with a loud voice and disrespectfully demand that the President not sign it and the Senate not ratify it. In the meantime, lovers of liberty have another way to make a clear statement of disrespect and contempt for Islam and demanding effective protection from its evil intentions. The International Qur’an Petition puts the most important evidence before the World Court and prays for injunctive relief. Please sign it and exhort everyone you can hope to influence to sign it and share it with their friends. We must not allow the lamp of liberty to be extinguished forever. The impetus for the present diatribe came from this article publiched by the U.S. Mission tyo the UN in Geneva. Promoting Respect for Religious Differences By Suzanne Nossel, Deputy Assistant Secretary of State Bureau of International Organization Affairs. Our government is engaged in subtle, highly polished dissembling. In order to point out the clever lies, I have reproduced excerpts from the article in block quote format, with Helvetica or Arial type face, interspersed with my commentary. I have added bold font emphasis to make the lies easier to spot. Take a close look at the title of the article, in bold blue text above. Do you spot the lie? The article is about a counter proposal offered as a substitute for the OIC’s campaign to outlaw criticism of Islam. It is not about respecting differences, it is about respecting Islam. When the differences between Christianity and Islam are considered, the differences are so stark that respect is impossible. Christians believe that Jesus Christ is the son of God, sent to save sinners through acceptance of God’s grace. We believe that he was crucified, died and was resurrected. Muslims believe that Isa, their name for Jesus, was fully human, Allah’s slave, not God’s son, was not crucified, neither died nor resurrected and will return as a genocidal warlord who will lead the Muslim army in its final conquest, exterminating the Jews. How in Hell can any sentient person exepct us to respect that blasphemy? The details, for those who don’t know, are documented in The Defamation of Jesus Christ. Over the last decade, we have witnessed a campaign to attempt to counter religious hatred through bans on speech under the rubric of prohibitions on the “defamation of religions.” This effort has taken root in a series of resolutions at the U.N.’s General Assembly in New York and its Human Rights Council in Geneva. Far from attempting to counter religious hatred, the OIC, as the representative of Islam in the absence of a Caliphate, is acting out religious hatred by attempting to impose Islam’s blasphemy law upon the entire world through the agency of the United Nations. Religious hatred is not the issue. Defamation is not the issue. Proscribing defamation by law would not reduce hatred in any case, it would only cause it to fester. Take a close look at Islamic law, quoted from Reliance of the Traveller, Book O. The penalty for apostasy is death. The code in O11.10 refers to the treaty of protection afforded to conquered Jews, Christians & Zoroastrians who, as an alternative to conversion to Islam, make annual payments of tribute and exist under conditions of humiliation & subjection. When a dhimmi violates those rules, the caliph can kill him at will. Islam’s Hellbent determination to impose its blasphemy law on us is not about defamation, it is about supremacism. Islam claims to have a monopoly on divine truth, all else is false. They are attempting to impose through “international law” what they can not yet impose by force of arms. Some U.N. member states supportive of these resolutions are banding together to try to impose a global ban on offensive speech in the form of a binding instrument under international law. Any criticism of Allah, Moe & their doctrines & practices is offensive to Islam. The prime examples they cite are the Motoons and Fitna:. Although the most famous of the cartoons depicts an explosive device, which Moe never had in his possession, he was, by his own admission, a terrorist. The irony of this effort is that the concept of “defamation of religion” has been used to crack down on religious minorities that espouse beliefs deemed by the State to defame a national or majority-supported religion. Moreover, many of the countries that support the defamation of religion apply the concept to protect one religion only, and are — within their own countries — accepting of hostile language and acts that target minority faiths. Irony? No, that is the intended result, not a misapplication. 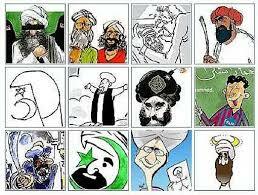 Defamation of Islam is a shibboleth created for political purposes, not a real and substantive issue. These contradictions demonstrate that the drive to impose a global ban on offensive speech will not protect members of all religions on an equal basis, as U.N. resolutions and international legal norms must do. Nor will they address the specific and legitimate concerns about the treatment and mistreatment of Muslim minorities globally. Concerns about the treatment of Muslim minorities warrant concerted action on the international stage, but through steps and measures that actually work, rather than bans on free speech. What legitimate concerns? We have laws against assault & harassment. It is not Muslims who are being murdered, raped, tortured and burned out of their homes, businesses and churches in Egypt,.Indonesia & Pakistan. It is not mythical assaults and murders they seek to prevent, it is revelation & recognition of the truth about Islam: that it is a war cult which seeks to destroy western civilization and plunge the world into theocratic tyranny. Measures to promote that objective are undesirable, whether or not they are effective. The United States has worked strenuously to oppose defamation-based approaches on the basis that they are inconsistent with fundamental freedoms of speech and expressions, including the values endorsed by U.N. member states through the Universal Declaration of Human Rights. The United States has given lip service to the concept of freedom of expression, but, in October of ’09, the State Department co-sponsored the Freedom of Opinion and Expression resolution, which substitutes “negative stereotyping” for “defamation”, a distinction without a difference. As an alternative to the efforts that would ban speech in order to prohibit “defamation of religion,” we are proposing to achieve the goal of promoting religious pluralism and acceptance of religious difference through the kinds of steps that we have seen be effective in our own country and across the globe: enactment and enforcement of laws prohibiting discrimination; bans on hate crimes; education, training and dialogue to promote religious tolerance. Islam’s scripture says that we are going to Hell and curses us in addition to declaring perpetual war against us. Religious pluralism? Acceptance?? In your dreams!! Why would anyone desire to promote tolerance of a “religion” which sanctifies and mandates genocidal conquest & terrorism? Tolerance must be reciprocal; Islam is not tolerant. The two ayat quoted above prove this fact without any room for doubt. Islam is a predator; We are prey. For the sake of safety, we must be allowed to truthfully discuss Islam. The Ad Hoc Committee will meet again in March.. We do not know how long it will take them to produce their protocol to ICERD, but I have no doubt that, barring a miracle, President Obama or his successor will sign it and the Senate will ratify it. One quote in that extremely significant article brings the matter to a critical head. Do you remember the ACORN voter registration scandals of ’08? The Democrats appear to be prepared to take it to a whole new level. Motor Voter was bad enough, this proposal will facilitate far more multiple voting and other frauds. If they can pack the voter registration roll with phantoms, they can use those registrations to stuff ballot boxes with impunity. and send a strongly worded email to your Representative & Senators. Tell them that their vote for universal voter registration will guarantee your vote against them in the next election cycle.